They light the fires at 2am. They put them out at four. Two hours later the men move in. In this field, it's the blue team, twenty of them. There's no uniform, but everyone has to wear the same colour so that it's clear which shift they've been on. That matters when the day is done and the sugar cane that they're cutting is weighed. The fire has softened the cane, and with constant sharpening a machete will cut through it with relative ease. But there's a big field to get through and as the sun climbs to its peak it gets very hot. Soya milk, laced with vanilla is handed out regularly, as are lumps of raw sugar shaped like fudge. The labourers bring their own lunch and if all goes well they'll take home about £10 ($17) at the end of the day. It's not much but it's twice the area's minimum wage. It's hard to believe that these men are part of the process of making ethanol - the most advanced alternative to petrol in use on a mass scale. 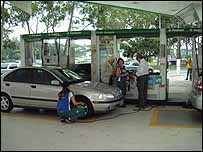 More than 80% of new cars now sold in Brazil are equipped to use ethanol as well as gasoline. Both fuels are available almost everywhere, and since ethanol can cost about a third less than petrol per litre at the moment (though the mileage is not quite as good), the home grown fuel is more popular than the foreign import. President Bush has challenged Americans to break their addiction to oil, but it could take a decade for the US to catch up with the progress made here. 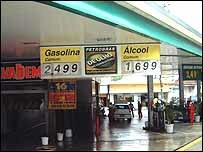 Oil would have to fall to $35 (£20) a barrel to compete with ethanol in Brazil. That's roughly half the price that crude has been sold for over the last six months. Some of the countries producing black gold have become less co-operative, more volatile or violent in that time, and there seems little prospect of the price falling significantly in the near future. The Brazilian President, Luiz Inacio Lula da Silva, is delighted with the "energy revolution" that's taken place. Having once been a shoe-shine boy in a country with record foreign debts, the future is looking a lot rosier. Some in the sugar industry claim that the country has already been able to cut imports by $400bn by reducing its reliance on oil. The focus now is on boosting exports. Japan is considering a deal to import up to six billion litres of Brazilian ethanol by 2008. 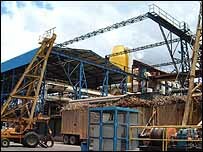 More than 70 new mills are due to open by 2012. At Grupa Carlos Lyra in Sao Miquel dos Campos, 90% of the cane is still refined into sugar, which will end up in our tea and cakes. But the sticky syrup leftover is pumped into a distillery. Yeast is added and a simple process of turning sugar into alcohol produces the fuel of the future. 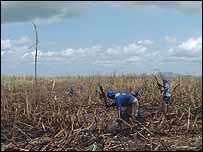 The smell where the cane is washed and cut is like manure. The tanks where ethanol ends up have an aura more reminiscent of a brewery. It takes about three days to transform a burnt and bruised branch into the clear liquid which Brazilians can put in their tanks. It's a big, dirty, smelly plant, and it stands out on a landscape that is otherwise dominated for miles but beautiful fields of cane. But it's a huge local employer and there's tremendous potential for the industry. Jose Marcio de Oliveira is proud of what they're doing here. "My country is leading the world", he says, with a smile.